Love, love, love my miles for millions prayer walks. :) I finally finished Isaiah and am enjoying Jeremiah. Time with family during "Dinner and Discipleship" is sweet. Paul says, "I like doing together as a family if makes everything stick. I like our family." :) Before we did homework on our own and then came together and talked about it. Now, we do it together from start to finish, and it only takes us fifteen minutes longer, but the conversation has been so much deeper. Hemingway, Martin Luther, C.S. Lewis, and Plato have been my most recent readings. I finally know where "The unexamined life is not worth living" quote comes from. It is Plato quoting Socrates in the Apologia, that is incorrectly translated as Apology in English when it is really his defense before they condemned him to die. Who knew? There is no author like Thomas Hardy. This is my third by him, and he always draws me in so that I cannot stay away for too long. This story was written in 1891 and is part of the naturalism genre. It drew criticism in the Victorian Era because of Hardy's sympathetic portrayal of Tess. The narrator is always sympathetic toward her, and I was too. As I listened to Ralph Cosham's excellent narration, I found myself crying out, "This should be subtitle 'a pure woman'!" not knowing that Hardy had already given it that subtitle to "raise the eyebrows of the Victorian middle-classes" (http://en.wikipedia.org/wiki/Thomas_Hardy). Vintage reading : from Plato to Bradbury : a personal tour of some of the world's best books / Robert Kanigel. Just stumbled upon this at our library website. I checked this out of the library once, but I didn't have time to really look at it. It overlaps with so many of my favorite books. Lovely times in the prophets lately. I always dread them. In spite of the judgment, there is hope and comfort and compassion. I am looking forward to Jesus in not too many days, but I now that I am in the middle of the waters of the prophets, I am not sinking. There is a life ring of hope. We pray because we submit to the God of the Universe who knows all, sees all, and loves us so much. There have been some things that I am pleading with God about lately. I am desperate in my prayer knowing that only He can do "exceeding abundantly beyond what I ask or imagine" (Ephesians 3:20). So, my soul feels like it is drinking living water lately. Beautifully written in flawless form. I liked this Hemingway quite a bit! This is a wonderful novella about an old Cuban fisherman named Santiago. I do not want to give too much away. 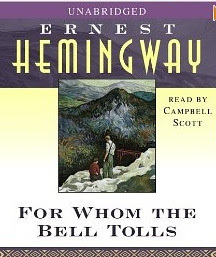 My husband gave more away than I would have liked, but he thought this would have been a better introduction to Hemingway than For Whom The Bell Tolls, which is his longest book. This is a story about courage, humility and pride, aloneness, companionship and love, age and youth, honor, and heroism. It has many layers of meaning. It won him the Pulitzer Prize in fiction in 1953. This is from the brilliantly artistic daughter of a high school friend of mine. Isn't it lovely? I find it is feast or famine with me. This week has been active, and I am tired. We went to Silver Creek Falls and The Oregon Garden yesterday for a total of nine hours of being out and about. Then, we came home and went out as a family, celebrating the boys finishing their finals. It was great, but I could barely get out of bed this morning. I wonder why? I had all sorts of grand intentions about getting myself to Group Power at 9:20 am, but I cannot seem to move. Tuesday and Wednesday I had so much energy, I wrote for two hours, went to Group Power did elliptical, met with Kathleen. Yesterday I ploughed through all my work early in the morning before our excursion. Now, I am ready to go back to bed. I couldn't be happier. My soul is feeling so lifted to God lately. I decided to cut back on the morbid tragedies for a while and read some things that life up my soul. Of course, I am reading the Bible, and it really helps that I am now in the "hopeful" part of Isaiah (51) because the judgment part was also when I was going through the little overwhelming mini-funk that I have been going through because of being out of BALANCE! So, that is so great. Open the Gates of Summer! I just had three glorious days at the Shalom Prayer Center in Mt. Angel, Oregon. What was lovely is that I didn't have some pressing emotional crisis. No one had devastated me by seething out vicious words or vitriol (like last time I was at the beach and had to spend five days working through something like that). It is the first extended time where I could just sit and soak. Definitely had some fears just below the surface that came in the quietness before God though. I was able to hear His voice for the immediate future. It took about 30 hours before heaven broke through as I unplugged from the world and just sat at a bench perched at the top of Mt. Angel and listened in the quietness. The gardeners with their leaf blowers were gone. The tractor laying fertilizer in the freshly mowed grass left, and there was just me and the wind and the birds and the gorgeous sunshine shining down on the green farmland below. I have much of a full day of writing ahead of me today as I am going on a prayer retreat for three days starting tomorrow morning. I want to work my way ahead in the Bible Book Club so that I can take a vacation this summer. Oh, I also have a meeting with Jennifer in the early afternoon, and I think she is very tired and needs some TLC. I have the energy for it though. I have been much better at balance these days. I also need to send back the bathing suit and dress that did not fit and cancel a subscription to something. Then, I will be totally free to go on my retreat. I want to read this book someday, but it isn't in my library! Reading Wodehouse novels is like dancing wildly to pop records in your living room at three in the morning while glugging alternate mouthfuls of white wine, frozen yogurt, and leftover chocolate from Christmas. This one involves a party at an English estate, single young men, a butler, various attractive women, a rich aunt you want to keep on the right side of, and a large pig. It's impossible to stay in a fed-up, resentful, or self-righteous state of mind when reading Wodehouse. Before I start my review, let me refer you to a fascinating NPR radio report by Susan Stamberg about how fierce political opponents, Barack Obama and John McCain, relate with the main character, Robert Jordan HERE. First off, let me say that I have always avoided Hemingway like the plague, but he is one of my husband's favorite authors. Also, four out of Hemingway's seven novels are on my list of "100 Great Books"! Can you believe that? My Book Dames Book Club decided to read this because we readTheir Eyes Were Watching God, and Alice Walker has said that her inspiration comes from Hurston. Hurston's writing was so beautiful. I found Alice Walker's less so. I know that The Color Purple is considered a classic, but I don't feel like it is well-written, and it is pretty crude, raw, gritty in parts. I warned my book club of this three weeks ago, but no one had responded. So, I plunged ahead with it. Just as I was finishing the last line on my iPod this morning, I heard a "ding" from Facebook with another person in the club who started it last night and said, essentially the same thing. I guess they didn't see what I wrote three weeks ago. So, we are rethinking it. I am really conservative. I know life can be gritty, but I felt Hurston did it in such a non-offensive way, whereas Walker (and Toni Morrison in The Bluest Eyes) are just distastefully crude.